Kansas Dept. of Commerce Interim Secretary Robert North; Kansas Dept. of Transportation Deputy Sec. BJ Harden; Dan Jones, Kubota VP; Kansas Dept. of Transportation Sec. Richard Carlson; Governor of Kansas, Jeff Colyer; Masato Yoshikawa, Kubota President and CEO; Edgerton Mayor Donald Roberts; Alex Woods, Kubota VP. Kubota Tractor Corporation today announced the completion of a 200-acre land purchase within Phase II of Logistics Park Kansas City in Edgerton, making the company the first major tenant for the industrial park. Governor Colyer met today with the company to tour the site where it will construct two, one million square-foot, state-of-the-art logistics facilities for its new North American Distribution Center (NADC). Kubota plans to plant solid roots in Kansas to expand distribution capacity and streamline logistics processes for the timely delivery of Kubota-branded service parts and equipment to U.S. customers. 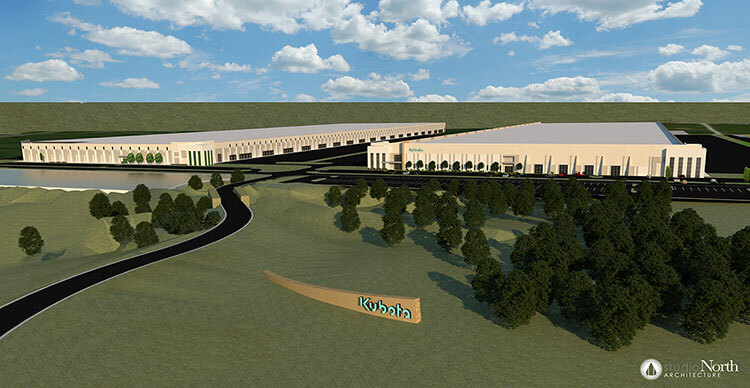 Kubota Tractor Corporation rendering of the future North American Distribution Center in Edgerton, Kansas. The City of Edgerton is located in the southwest corner of Johnson County, a suburb of the Kansas City area. Edgerton defines itself as the unique juxtaposition of a small town with strong community values and a world-class inland port with direct connection to the global supply chain. As home to Logistics Park Kansas City (LPKC), Edgerton is forging connections that have a global reach with a local impact. New roads, projects and new opportunities are paving the way for a bright future in Edgerton. The city boasts a skilled workforce, pro-business environment, highway accessibility and excellent quality of life factors. To learn more, visit www.edgertonks.org. NorthPoint Development is a privately held real estate development company specializing in complex master-planned projects. NorthPoint has logistics-oriented developments in 11 markets across the United States and serves as the real estate developer for Logistics Park Kansas City (LPKC), a 1,700-acre inland distribution hub that includes a public private partnership and intermodal facility. For more information, visit www.logisticsparkkc.com.